Wappingers Falls, NY (February 28th 2014) Follr, Inc. today announced a content licensing agreement with The Digital Beyond, a blog about digital existence and what happens to it after death. Under the agreement Follr users will be able to read and view Digital Beyond content, including blog posts and videos, from the Follr software platform and via the company’s social media channels. The Digital Beyond is co-written by Evan Carroll and John Romano, thought-provokers in the budding digital afterlife industry. Their work, first presented at SXSW 2009, was immediately mentioned on NPR’s All Tech Considered. John and Evan then created The Digital Beyond as a think tank for digital death and legacy issues. The Website has grown into the go-to source for digital afterlife information. They subsequently published “Your Digital Afterlife“, a book that discusses the value of digital assets and explains how they can be secured. To access the content visit Follr.com. Follr, Inc. (www.follr.com) is a software company founded in 2011. With offices in California and New York Follr provides Web-based Digital Identity Websites and business networking tools to individuals and corporations. A Digital Identity Website allows an individual, company or brand to tell their story using a combination of personal or corporate history, social media profiles (Facebook, LinkedIn, Foursquare etc.) and content. It is a personally branded Website used as an initial point of contact and represents an aggregation of all online and offline information. It is accessed by an enduring, easy to remember URL and represents a more complete picture and story in an increasingly digital world. Follr is funded through Blossom Ventures. For more information see the company Website, Facebook or Twitter. Evan Carroll is a user experience designer, digital marketing strategist, author and speaker from Raleigh, NC. He is co-founder of The Digital Beyond, a blog and think tank devoted to digital afterlife and legacy issues. He is the author of the book, Your Digital Afterlife: When Facebook, Flickr and Twitter Are Your Estate, What’s Your Legacy? (New Riders Press, 2011). 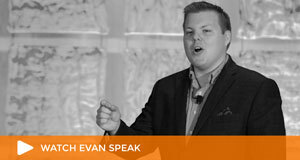 Evan has appeared in numerous media outlets including The New York Times, The Wall Street Journal, NPR’s Fresh Air, CNN, PBS NewsHour, Popular Science, Fox News, CNN and The Atlantic. Evan holds MS and BS degrees from UNC-Chapel Hill’s School of Information and Library Science. He currently serves on the advisory board for the Triangle chapter of the User Experience Professionals Association and as President-Elect of the Triangle American Marketing Association. Unfortunately the answer isn’t as certain as we might presume. There are numerous legal, cultural, and technical issues that could prevent access to these assets, and if you don’t take steps to make them available to your heirs, your digital legacy could be lost forever. Written by the creators of TheDigitalBeyond.com, this book helps you secure your valuable digital assets for your loved ones and perhaps posterity. Whether you’re the casual email user or the hyper-connected digital dweller, you’ll come away with peace of mind knowing that your digital heirlooms won’t be lost in the shuffle. 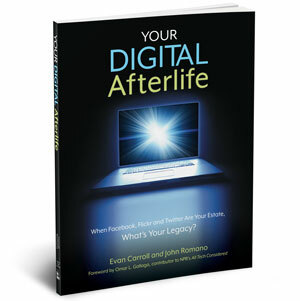 For more information visit www.yourdigitalafterlife.com. 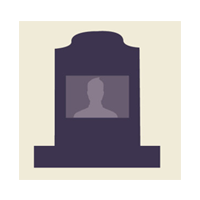 Here's a great infographic from WebpageFX that shows what happens to popular online accounts when you die.